Paul George scores 47 as the Thunder get the win over the Trail Blazers, 120-111. Tobias Harris scores 26 points to go along with 10 points to lead the Clippers to a win over the Thunder, 108-92. Russell Westbrook scores a game-high 29 points as the Thunder get the win over the Heat, 105-99. Raymond Felton throws the lob up and Terrance Ferguson catches and finishes with the circus reverse layup. Raymond Felton throws it up to Terrance Ferguson for the reverse alley-oop layup. 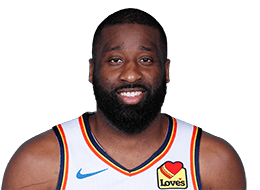 Patrick Patterson gets the offensive rebound then kicks it out to Raymond Felton for the three-point that beats the buzzer. Raymond Felton throws it up to Jerami Grant for the alley-oop slam. Terrance Ferguson flushes the ball with an assist from Raymond Felton. CJ McCollum Scores 28 points and Damian Lillard adds 20 as the Blazers defeat the Thunder 108-100. Paul George leads all scoring with 26 points as the Thunder get the win over the Magic, 112-105. Raymond Felton with the nice bounce pass to Jerami Grant for the two-handed slam. Paul George leads all scoring with 33 points as the Thunder get the win over Grizzlies, 110-92. 2012-13 (Knicks): First year of his second stint with Knicks was marked by trademark steady backcourt leadership... Appeared in 68 games (all starts) and averaged 13.9 points, 5.5 assists, 1.38 steals and shot .427 (377-882) over 34.0 minutes...Went 93-258 (.360) from Downtown...Season Highs: Points: 27 (twice): Assists: 11 (Nov. 21 at Dallas); Rebounds: 6 (four times)...Led Knicks in assists 39 times and recorded four double-figure assist games (NYK’s only double-digit assist games of 2012-13 season)...Recorded 10 20-plus scoring games, leading Knicks in scoring five times (season-high 27 points twice in back-to-back games, Dec. 6-8)...From Downtown, had two four-homer games, one five-homer game, and nailed a career-high-tying six three-pointers on Dec. 6 at Miami...Dished off a Knicks season high 10 assists without a turnover on Nov. 25 vs. Pistons...Authored seven games with at least five assists and no turnovers...Injuries: Missed 12 games in mid-season due to right pinky injury...Suffered fractured right pinky in third quarter of Christmas Day loss at Lakers. Played through the injury for 10 points and six assists in 36 minutes...X-rays on Dec. 26 revealed fracture, then missed 12 straight games, Dec. 26-Jan. 24...DNP (CD) - not injury-related - in regular season’s last two games...Due to injury-shortened season, fell shy of qualifying for NBA Leader Board (needed 70 games, 400 assists or 125 steals)... Key Games: Poured in a game-high 25 points in comeback win at San Antonio, Nov. 15...Scored 18 points with Knicks season-high 11 assists in loss at Dallas, Nov. 21...Huge factor in comeback win at Charlotte, Dec. 5, with 17 points and nine assists with no turnovers...Main cog in 20-point rout of Heat at Miami, Dec. 6, with team- and season-high 27 points (career-high-tying 6-10 from Downtown). In next game, scored game-high 27 points (9-30 FGA) for second straight game, in loss at Chicago, Dec. 8, recording career-high FGA (30)...Vital down-the-stretch factor in win over Warriors, Feb. 27. In game’s final 1:28, recorded key block on Stephen Curry jumper with score tied at 105 (after Curry had already scored 54 points), clutch steal on Festus Ezeli pass with :43.7 left, and huge offensive rebound off his own FT miss with :33.9 left to keep NYK possession alive...Key figure in win at Utah which kicked off 13-game winning streak, Mar. 18, with 19 points (8-12 FGA), including eight points in deciding fourth quarter...Banked in a 49-foot three-pointer from midcourt to end the first half, Mar. 31 vs. Celtics...Scored 19 points in season-high 49 minutes in OT loss at Chicago, Apr. 11, that snapped 13-game winning streak. 2011-12 (Blazers): In lone season in Portland, averaged 11.4 points, 6.5 assists (12th in NBA) and 1.30 steals over 31.8 minutes in 60 games (56 starts)...Went 100-124 FTA (career-high .806)...Ranked 12th in NBA in assists (6.5)...Despite career-low scoring average (11.4), had six 20-plus scoring games and one 30-plus effort (season-high 30 in OT win at Dallas, Apr. 6)...Notched eight double-figure assist games, including season-high 12 at New Orleans, Jan. 16...Missed three games with injury in season’s final weeks (left foot/Achilles)...Traded to Knicks with Kurt Thomas, Jul. 16, 2012. 2010-11 (Knicks-Nuggets): Split standout season between Knicks and Nuggets, making immediate impact in NY prior to being dealt to Denver in mid-season Carmelo Anthony deal...Overall in 75 games (54 starts), averaged career-highs 15.5 points and 8.3 assists, shooting .425 over 36.5 minutes...116-329 (.353) from Downtown (career high 116 homers)...Played in 54 games (all starts) for Knicks, then came off the bench in 21 contests for Denver...Ranked sixth in NBA in assists (8.3) and eighth in steals (1.67)...Recorded a total of 30 double-figure assist games (27 for Knicks)...Prior to trade, averaged 17.1 points and 9.0 assists with .423 shooting (339-801) over 38.4 minutes as a Knick...Led Knicks in assists 51 times (in 54 games)...Had 19 20-plus scoring games for NYK, and one 30-plus effort...Went 157-181 FTA (.867), including 28 consecutive FTM from Oct. 30-Nov. 16...Rang up six straight double-figure assist games, Dec. 12-25, with 12.3 apg (74) in span...Scored career-high 35 points (13-17 FGA, 4-7 from Downtown) with 11 assists at Golden State, Nov. 19...Key factor in 2OT win at Detroit, Nov. 28, with 23 points and 11 assists in 53 minutes...Scored 28 points in win over Raptors, Dec. 8. Capped night with dramatic three-point bomb that danced on the rim, then dropped through with :02.7 left to lift Knicks to 113-110 win...Dished off 17 assists (his high as a Knick).in win over Nuggets, Dec. 12...Key factor in stunning win over 29-4 Spurs, Jan. 4, with 28 points, seven assists and no turnovers in 37 minutes...Recorded first career triple-double on Jan. 7, 2011 at Phoenix (23 pts, 11 ast, 10 reb)...Tied Knicks club record by ringing up 14 assists without a turnover at Portland, Jan. 11...Traded to Denver in three-team (Minnesota) Carmelo Anthony deal on Feb. 22, 2011...Averaged 11.5 points and 6.5 assists over 31.6 minutes in 21 games off the bench for Nuggets...Nuggets highs 22 points on Mar. 14 at New Orleans, 14 assists (Nuggets season high) on Apr. 9 vs. Minnesota...Missed two games in March (sprained left ankle)...Came off the bench in all five games of Nuggets’ first round Playoff loss to Thunder, with 11.6 ppg over 30.4 mpg... Traded to Portland as part of three-team trade with Dallas, Jun. 23, 2011. 2009-10 (Bobcats): Helped lead Bobcats to first NBA Playoff berth in franchise history, averaging 12.1 points, 5.6 assists (19th in NBA) and a career-high .459 from the field over 33.0 minutes in 80 games (all starts)...On NBA Leader Board, finished 19th in assists (5.6), 15th in steals (1.54), 18th in assist-to-turnover ratio (2.65) and 20th in steals-to-turnover ratio (0.73)...Had six 20-plus scoring games and five 10-plus assist games...Season-high 28 points (11-14 FGA, 4-4 from Downtown) on Dec. 4 at New Jersey...Broke Knicks’ hearts in season’s second game with 22 points in 2OT win over NYK at Charlotte, Oct. 30. Forced second OT with driving layup with :13.4 left in first OT (88-88)...Missed two games due to injury (one with sprained right ankle, one with flu-like symptoms)...Averaged 11.8 points in Playoffs, starting all four games as Bobcats were swept in first round by Magic in first-ever post-season appearance...Became free agent, Jul. 1, 2010; signed with Knicks, Jul. 12, 2010. 2008-09 (Bobcats): Played in all 82 games (81 starts) and logged career-high 3,086 total minutes (37.6 mpg, 15th in NBA)...Averaged 14.2 points, 6.7 assists (13th in NBA) and 1.54 steals (11th in NBA)...Career-high 126 total steals... Season-high 32 points vs. Sixers, Apr. 7, 2009...Notched a career-high seven steals on Nov. 22 vs. Bucks...Season-high 14 assists on Dec. 1 vs. Timberwolves...Came within one assist of a triple-double in Jan. 27 2OT win at Lakers (21 pts, 9 ast, career-high 11 rebs). 2007-08 (Bobcats): Fine all-around season with 14.4 ppg and 7.4 apg (seventh in NBA) over 37.6 mpg (22nd in NBA) in 79 games (all starts)...Had 13 20-point scoring games and 19 double-figure assist games...Season-highs 29 points on Feb. 11 vs. Lakers, 15 assists on Jan. 14 vs. Nuggets...Nailed 22 straight FT, Feb. 22-Mar. 5...Missed three games due to injury (knee/ankle). 2006-07 (Bobcats): Standout sophomore campaign with 14.0 ppg and 7.0 apg (tenth in NBA) over 36.3 mpg in 78 games (75 starts)...Ranked 14th in NBA with 1.51 spg...Bobcats were 9-2 when he had a points-ast double-double...Season-high 24 points on Mar. 10 vs. Grizzlies...Enjoyed remarkable two-day stretch just prior to New Year’s: Logged career-high and NBA season-high 57 minutes in 3OT win over Lakers, Dec. 29, 2006 (22 pts, 15 ast). Just 24 hours later, dished off a career-high 19 assists at Indiana, Dec. 30, 2006...Scored 17 points with six assists for Sophomores in T-Mobile Rookie Challenge at NBA All-Star 2007 in Las Vegas...Missed four games due to injury (two in January with sprained left ankle). 2005-06 (Bobcats): NBA All-Rookie Second Team...Named to NBA All-Rookie Second Team and finished fourth in T-Mobile Rookie of the Year voting (won by Hornets’ Chris Paul)...Three-time T-Mobile NBA Eastern Conference Rookie of the Month (February, March, April)...Averaged 11.9 points and 5.6 assists (21st in NBA) over 30.1 minutes in 80 games (54 starts)...Had 11 20-points scoring games and two 30-points games...Double-figure assists 14 times...Among NBA rookies, finished fourth in scoring (11.9), second in assists (5.6)...Season-highs 31 points on Feb. 25 at Phoenix, 14 assists on Apr. 17 vs. Knicks at MSG...Missed two games due to injury (sprained right big toe, abdominal strain). Career Transactions: Drafted by Charlotte in first round (fifth overall) of 2005 NBA Draft (early entry selection). Became free agent, Jul. 1, 2010; signed by New York, Jul. 12, 2010. Traded to Denver as part of three-team deal (Minnesota) in which Knicks acquired Carmelo Anthony and Chauncey Billups, Feb. 22, 2011. Traded to Portland as part of three-team deal (Dallas), Jun. 23, 2011. Traded to New York with Kurt Thomas for Jared Jeffries (sign-and-trade), Dan Gadzuric, draft rights to Kostas Papanikolaou and Giorgos Printezis and a protected second-round draft pick, Jul. 16, 2012. Traded by the New York Knicks with Tyson Chandler to the Dallas Mavericks for Jose Calderon, Samuel Dalembert, Wayne Ellington, Shane Larkin, a 2014 2nd round draft pick and a 2014 2nd round draft pick, June 25, 2014. Three-year averages of 12.5 points and 6.9 assists in 101 games for North Carolina...First player in Tar Heels history to record 1,000 points, 600 assists, 300 rebounds, 150 steals and 100 3PT FGM...Fourth on Tar Heels list in career assists (698) and second in assists per game (6.9)...In his final (junior) season, was named to NCAA Final Four All-Tournament Team after helping lead North Carolina to 2005 NCAA title, averaging 13.7 points and 6.8 assists in NCAA Tourney...Named First Team All-ACC, Honorable Mention All-ACC Defensive and Third Team Associated Press All- American...As a sophomore in 2003-04, led ACC and ranked fifth in the nation with 7.1 assists...In 2002-03, became first freshman in UNC history to be voted team MVP. Raymond Bernard Felton Jr....Has two older sisters, Charmaine and Juvonna...Charmaine attended North Greenville College on a softball scholarship and Juvonna went to Claflin College on a basketball scholarship...Named Naismith Award winner by the Atlanta Tipoff Club as the 2002 National High School Player of the Year and was also Gatorade National Player of the Year...Led Latta HS to back-to-back state championships and a 104-9 record in his career... Two-time Mr. Basketball winner in South Carolina...Broke state career scoring record with 2,992 points....Helped lead East to victory in McDonald’s All-America Game at MSG...In high school, played football (quarterback and safety) and baseball (pitcher and shortstop) for two years and ran the 100 meters one year.